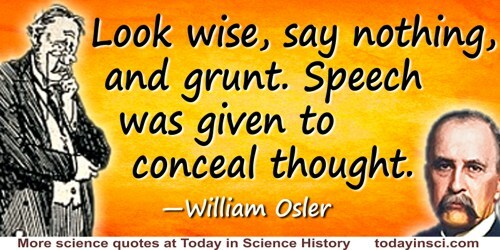 Look wise, say nothing, and grunt. Speech was given to conceal thought. William Bennett Bean (ed. ), Sir William Osler: Aphorisms from his Bedside Teachings and Writings, No. 267 (1950), 126. Medicine, like every useful science, should be thrown open to the observation and study of all. It should, in fact, like law and every important science, be made part of the primary education of the people. … We should at once explode the whole machinery of mystification and concealment—wigs, gold canes, and the gibberish of prescriptions—which serves but as a cloak to ignorance and legalized murder. Populist philosophy, of Samuel Thomson (1769-1843), founder of the Thomsonian System of medicine, as stated in New York Evening Star (27 Dec 1833)., as cited in the Thomsonian Recorder (17 Jan 1835), 3, 127. Quoted in Paul Starr The Social Transformation of American Medicine (1984), 56. Science has thus, most unexpectedly, placed in our hands a new power of great but unknown energy. It does not wake the winds from their caverns; nor give wings to water by the urgency of heat; nor drive to exhaustion the muscular power of animals; nor operate by complicated mechanism; nor summon any other form of gravitating force, but, by the simplest means—the mere contact of metallic surfaces of small extent, with feeble chemical agents, a power everywhere diffused through nature, but generally concealed from our senses, is mysteriously evolved, and by circulation in insulated wires, it is still more mysteriously augmented, a thousand and a thousand fold, until it breaks forth with incredible energy. Comment upon 'The Notice of the Electro-Magnetic Machine of Mr. Thomas Davenport, of Brandon, near Rutland, Vermont, U.S.', The Annals of Electricity, Magnetism, & Chemistry; and Guardian of Experimental Science (1838), 2, 263. Seldom, if ever, was any knowledge given to keep but to impart; the grace of this rich jewel is lost in concealment. 'The Rapture of Elijah', The Works of Joseph Hall, Vol 2, Contemplations (1808), 27. That alone is worthy to be called Natural History, which investigates and records the condition of living things, of things in a state of nature; if animals, of living animals:— which tells of their 'sayings and doings,' their varied notes and utterances, songs and cries; their actions, in ease and under the pressure of circumstances; their affections and passions, towards their young, towards each other, towards other animals, towards man: their various arts and devices, to protect their progeny, to procure food, to escape from their enemies, to defend themselves from attacks; their ingenious resources for concealment; their stratagems to overcome their victims; their modes of bringing forth, of feeding, and of training, their offspring; the relations of their structure to their wants and habits; the countries in which they dwell; their connexion with the intimate world around them, mountain or plain, forest or field, barren heath or bushy dell, open savanna or wild hidden glen, river, lake, or sea:— this would be indeed zoology, i.e. the science of living creatures. A Naturalist's Sojourn in Jamaica (1851), vi-vii. The first steps in Agriculture, Astronomy, Zoology, (those first steps which the farmer, the hunter, and the sailor take,) teach that nature's dice are always loaded; that in her heaps and rubbish are concealed sure and useful results. The truth may not be helpful, but the concealment of it cannot be. Unfortunately what is little recognized is that the most worthwhile scientific books are those in which the author clearly indicates what he does not know; for an author most hurts his readers by concealing difficulties. As quoted in Nicholas J. Rose, Mathematical Maxims and Minims (1988). Also used as an epigraph without citation in Morris Kline, Mathematical Thought From Ancient to Modern Times (1990), Vol. 2, 752. If you know the primary source, perhaps in French, please contact Webmaster. …what is man in the midst of nature? A nothing in comparison with the infinite, an all in comparison with nothingness: a mean between nothing and all. Infinitely far from comprehending the extremes, the end of things and their principle are for him inevitably concealed in an impenetrable secret; equally incapable of seeing the nothingness whence he is derived, and the infinity in which he is swallowed up.